Something is not right here. This image looks completely terrifying. But don’t worry. This story is more likely to leave you laughing than freaked out. I love kids as much as the next person. In fact, maybe even more. But I, like many of you, have had my fair share of failed moments while dealing with kids. This woman was babysitting her niece for the first time. She put her niece to sleep while often checking the baby monitor to ensure her little niece’s safety. Then the last time she checked, she got this shocking viewpoint. Her niece had finally fallen to sleep…. on her head. Her legs were thrown over the bars of the crib and she was balanced precariously upon her head. She had the thought to photograph the screen before going and moving her niece. The aunt, Mikaela, tweeted the picture saying, “This is my first time babysitting and idk where I went wrong but my niece is currently asleep on her head,” she wrote. Her post went absolutely viral. It has been shared more than 55,000 already and will likely continue to climb the ranks. Kids being completely strange is nothing new to us, but somehow it still makes us laugh. Luckily the little girl was completely fine. Mikaela helped the child find a more comfortable position, but she made sure to get some laughs out of it. 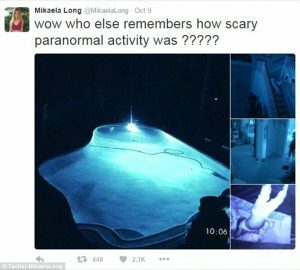 Even eventually comparing it to the horror movie Paranormal. If you’ve seen the movie, you might understand what a scarily accurate comparison that is. Advice came pouring in from twitter users everywhere. Some expressing concern about the child’s health and blood circulation, but mostly to share stories of their won crazy experiences with children. Can anyone else relate to this aunt’s experience?